These critical battles might be remembered only as a side note in American history if not for the courageous efforts of a small group of Union and Confederate veterans who waged their own fight to preserve these battlefields and honor those who fought here. In 1890, their efforts paid off when Congress established Chickamauga and Chattanooga as the nation's first national military park. Originally maintained by the War Department, Chickamauga and Chattanooga National Military Park was transferred to the National Park Service in 1933. Two visitor centers orient visitors to the battlefields. At Chickamauga Battlefield in Fort Oglethorpe, Georgia, the visitor center is open daily from 8:30 am to 5 pm. You can browse exhibits relating to the campaign and battle of Chickamauga, tour the Fuller Gun Collection, and watch the award-winning orientation film, “The Chattanooga Campaign–Death Knell of the Confederacy.” Be sure to obtain the park brochure containing a self-guided driving tour guide for the Chickamauga Battlefield and ask a ranger about the cell phone tour option. For added historical perspective, try one of the ranger-guided, car caravan tours. They take place every weekend throughout the year and daily between Memorial Day and Labor Day. The Lookout Mountain Battlefield visitor center, atop Lookout Mountain, Tennessee, is open daily from 9 am to 5 pm. You'll find exhibits relating to the campaign and battles for Chattanooga, self-starting orientation programs, and the 13'x30' James Walker painting—“The Battle of Lookout Mountain.” You'll want to pick up the park brochure with the Point Park self-guided walking tour. Point Park, adjacent to the visitor center, offers excellent views of the Chattanooga area. Don't miss the ranger-guided walking tours to learn about the desperate fighting that took place on the slopes of the mountain in 1863. While in Point Park, be sure to visit the Ochs Museum and Observatory. You'll find excellent exhibits about the Cracker Line, photography on Point Lookout, and Civil War signaling—a method of communication used heavily during the Chattanooga campaign. The observatory offers visitors a commanding view of the Tennessee River as it bends around Moccasin Point. In 2013, commemorative events are scheduled from September through November to mark the 150th battle anniversaries. 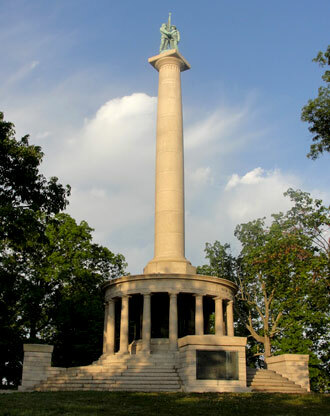 Visitors can take part in ranger-guided programs at Chickamauga, Lookout Mountain, and Missionary Ridge battlefields. 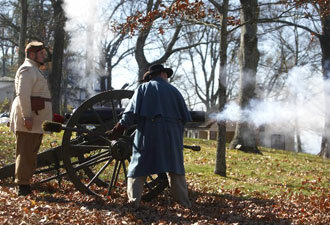 Living history programs include infantry and artillery demonstrations and musical performances. Chickamauga and Chattanooga National Military Park's younger visitors can participate in the Junior Ranger and the Civil War Trading Card programs. Rangers at either visitor center can share the details. Don't delay in planning your getaway to the Civil War's “Gateway” and America's first national military park.